Life style koubou uploaded OBROS COFFEE through Add A Home. The building we were requested to renovate was a rental building which had traditionally been used as a base by a post office etc. for commercial purposes. The building was planned to be dismantled after more than 50 years of serving. In order to make it usable as a shop, reinforcement of pillars including the ones on the tilted second floor was essential. While the pillar reinforcement required the outer wall to be dismantled and repaired, it would put great pressure on the limited budget. Instead, we decided to make use of the big space which was too much for the brothers in the first place and build a new store space without fixing the outer wall. We drew inspiration from an episode that coffee production is agriculture and installed sheets of glass on a wooden frame to build a box-like structure resembling a greenhouse. Dismantlement of the outer wall created extra space under the eaves, a ‘passageway’ between the outside and the inside. The passageway soon became the friendly ‘entrance’ to the shop. 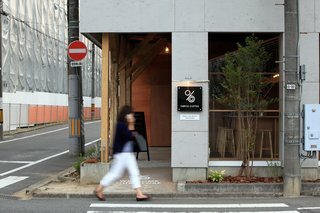 The transparency of the building gave the place a comfortable, welcoming atmosphere and opened the hearts of others, allowing customers to enjoy their cup however they want. The older generation who have known the building for a long time will connect with the new generation through coffee. This way, we were able to protect the building by bringing it back to life as a place for new communities. The ‘passageway’ connecting the shop and the outside created a new outdoor space in the neighborhood and became the ‘entrance’ where the brothers would enjoy chatting with people passing by (maybe even while cleaning the shop), naturally welcoming people into the shop. The space brings light to the neighborhood, entertains people coming and going and is changing the atmosphere of the city day by day.